The DEA is set to cut Schedule II opioid manufacturing by 20% next year. Sessions Criticizes Washington Legalization in Letter to State Officials. 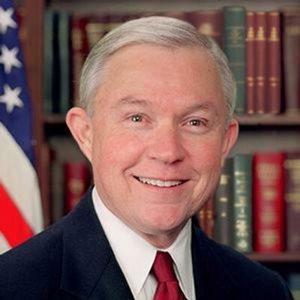 Attorney General Jeff Sessions sent a letter late last month to officials in Washington state challenging the way the state has implemented marijuana legalization and asking them to address concerns raised by a Northwest High Intensity Drug Trafficking Area (HIDTA) report critical of legalization. That report, Sessions wrote, "raises serious questions about the efficacy of marijuana 'regulatory structures' in your state." He cited portions of the report focusing on the diversion of legal weed out of state, drugged driving, and use by minors, all of which are areas flagged by the Obama administration's Cole memo as possibly being grounds for federal intervention. Los Angeles City Council President Proposes Pot Bank. LA City Council President Herb Wesson called in a speech late last month for the city to create a bank that would serve the marijuana industry, as well as other social needs in the city. Citing images of pot shop owners lugging around sacks of cash, he argued that city officials had a responsibility to figure out a way to make legalization work and that access to banking was a key part of it. New Jersey Panel Advises Expanding List of Qualifying Conditions. In a report issued last week, the state's Medicinal Marijuana Review Panel said it was ready to approve 43 more qualifying medical conditions for medical marijuana. Among them are chronic pain, migraines, anxiety, opiate-use disorder, arthritis, Alzheimer's disease, autism, and Tourette syndrome. But it's not a done deal yet -- there's a two month public comment period now, and the state health commissioner makes the final decision, after that. DEA Proposes Cutting Amount of Opioids Manufactured Next Year. In a Federal Register notice dated August 7, but available for viewing now, the DEA is proposing reducing the amount of Schedule II opioid pain relievers manufactured in the US by 20% in 2018. "Demand for these opioid medicines has dropped," the DEA, citing prescription data. "Physicians, pharmacists, and patients must recognize the inherent risks of these powerful medications, especially for long-term use," said Acting Administrator Chuck Rosenberg in a statement. "More states are mandating use of prescription drug monitoring programs, which is good, and that has prompted a decrease in opioid prescriptions." Las Vegas Civil Asset Forfeiture Happens Mainly in Poor, Minority Neighborhoods, Report Finds. A new report from the Nevada Policy Research Institute shows that civil asset forfeiture in the city happens mostly in poor and minority neighborhoods. The report found that two-thirds of all seizures were made in zip codes where the nonwhite population averages 42% and the poverty rate was 27%. The report also found that more than half of all seizures were for cash or assets valued at less than $1,000. Las Vegas Metro Police seized more than $2.1 million last year, the report found. In recent years, seizures ranged from a high of $515,000 in one case to a low of $74 in another. Canada is expanding the use of safe injection sites, the man behind Florida's successful medical marijuana constitutional amendment is suing the state over a smoking ban enacted by lawmakers, Massachusetts lawmakers continue to struggle with how to implement marijuana legalization, and more. Massachusetts House Speaker Wants Marijuana Talks Suspended Until Budget is Passed. Legislators locked in a battle over how to implement the state's voter-approved pot legalization law are being told to put the issue on hold until solons can get a budget passed. House Speaker Roberto DeLeo (D), whose chamber is backing a plan that radically increases taxes and would allow localities to ban marijuana businesses without a popular vote, called Wednesday for setting the issue aside to take on the budget. But Senate President Stan Rosenberg (D) countered that the Senate could work on both bills and that "mischief makers are once again at work." 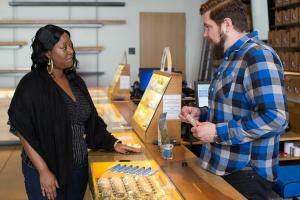 Nevada Opening Pot Sales Exceed Store Owners' Expectations. Legal marijuana sales that began just after midnight Saturday have exceeded the expectations of pot shop operators. Long lines formed in the wee hours Saturday morning, and shops are continuing to report heavy interest, with lines forming again before shops opened for business on Monday. "I'm very happy with the way sales have gone and continue to go, especially when you consider that the word didn't really get out ahead of time," Andrew Jolley, president of the Nevada Dispensary Association and a store owner told Leafly. "The public really only had a couple of weeks' notice, whereas Colorado had a full year to prepare." Florida Sued Over No Smoking Provision in Medical Marijuana Law. Orlando attorney John Morgan, the mastermind and chief funder of the state's voter-approved medical marijuana law, filed a lawsuit Thursday challenging a legislative ban on smoking medical marijuana. He is asking the courts to throw out the implementing law, saying legislators violated the will of the voters by altering the constitutional amendment they approved last November. "Inhalation is a medically effective and efficient way to deliver Tetrahydrocannabinol (THC), and other cannabinoids, to the bloodstream," the lawsuit argues. "By redefining the constitutionally defined term 'medical use' to exclude smoking, the Legislature substitutes its medical judgment for that of 'a licensed Florida physician' and is in direct conflict with the specifically articulated Constitutional process." West Virginia Medical Marijuana Law Now in Effect. The state's Medical Cannabis Act went into effect Wednesday, but it could still be months or years before Mountain State patients are able to medicate with marijuana. But now an advisory board has been appointed to create a regulatory framework for medical marijuana regulations, and it could be 2019 before patients are able to legally purchase their medicine. Colorado Employers Begin to Walk Away from Testing for Marijuana. Changing social attitudes and a tight labor market are pushing employers in the state to drop screenings for marijuana from pre-employment drug tests, said a spokesman for the Mountain States Employers Council. "We're finding that for employers, it's such a tight labor market, that they can't always afford to have a zero-tolerance approach to somebody's off-duty marijuana use, Curtis Graves told Colorado Public Radio. Mississippi Law Easing Naloxone Access Now in Effect. As of July 1, health care providers can write "standing prescriptions" for the opioid overdose reversal drug for family members of people strung out on opioids. "This will save many lives," said Rep. Tommy Reynolds (D-Water Valley). Canada Expanding Safe Injection Sites. Once there was only InSite, the Vancouver safe injection site under constant assault from the Conservative federal government. But now, the Liberals are in power, and the number of safe injection sites has expanded to seven, including three in Montreal and another in Vancouver. Another Montreal site is set to open soon, and so are three in Toronto, with more than a dozen other potential sites being considered. It's been less than four years since the first legal recreational sales in the United States took place in Colorado, but since then, the US marijuana industry has been creating jobs at rapid pace, and there are now more people employed in the pot industry than there are working in a number of common professions. That's according to a new report from the Marijuana Business Daily's Marijuana Business Factbook 2017, which pegged the size of the cannabis labor force at somewhere between 165,000 and 230,000 full- and part-time workers. That's compared to 169,000 massage therapists, 185,000 bakers, and 201,000 dental hygienists. And marijuana industry workers are on a path to shortly exceed the number of telemarketers (238,000) and pharmacists (297,000). Granted, the legal marijuana industry begins with a base of several tens of thousands of workers producing and selling medical marijuana products, especially in California, with its loose medical marijuana law, but the boom is being propelled by growth in the recreational market, and that is only set to continue and accelerate as more legal states come online next year, including California, Maine, and Massachusetts. Nevada joined the ranks of the legal pot selling states on July 1. California's recreational pot market by itself could generate around $5 billion in annual retail sales within a few years, doubling the size of the current legal weed market and creating a massive impact on job creation there. In arriving at its numbers, Marijuana Business Daily included employment figures for retailers, wholesale growers, edibles and concentrates producers, testing labs, and ancillary firms, such as companies providing legal, marketing, security or other services to marijuana companies. The industry daily used a variety of methodologies, including survey data, on the average number of employees for each kind of company in the business, and that data was then applied to the estimated number of companies in each sector to arrive at final estimates. One important caveat: The employment numbers mentioned here cover only a fraction of the people involved in the marijuana business -- those involved in the legal marijuana business. Even when California, Maine, and Massachusetts begin legal retail sales next year, the legal pot states will only amount to about one-fifth of the US population, and people are growing and selling marijuana in all the other states, too. From black market growers to clandestine dabs lab workers to cross-country couriers to dorm-room dealers, the number of people making a living in the illegal pot industry undoubtedly still dwarfs the number doing it legally. Marijuana is legal in eight states and the District of Columbia, and medical marijuana is legal in nearly 30 (although often under quite restrictive regulatory schemes). Between the two, legal weed is generating total annual sales of between $4 billion and $4.5 billion. But legal marijuana sales are dwarfed by sales in the black market, which according to a recent report in Marijuana Business Daily, accounts for about ten times the size of the legal market, or about $45 billion to $50 billion. That's still only about half the size of the legal beer and tobacco market, and it's more than it might be when legalization ultimately drops prices, which most observers expect. Nevertheless, it is nothing to sneeze at, and it puts marijuana well ahead of some major American economic sectors. Here are ten products or services already being surpassed by pot, with the first five being smaller than the legal market and the second five being smaller than the estimated overall market, including both licit and illicit markets. Some of these industries could hope for synergistic effects, though. Thin Mints are the hands-down winner when it comes to Girl Scout cookies, accounting for 25% of all sales, but that's only around $200 million. All told, Americans shelled out $776 million for the treats last year. That's a lot of cookies, but that's less than one-quarter of the size of the legal pot market. Shots with lime and salt, margaritas, Tequila sunrises... Americans gulp down a huge volume of the Mexican agave concoction every year, but the $2.3 billion in annual tequila sales is only half the size of the legal marijuana market. Of course, tequila is only a fraction of the alcohol industry, which still rocks compared to weed. Beer sales alone are more than $100 billion a year. Who doesn't love music and want it handy on all their devices? Music streaming services such as Spotify, Pandora, Apple Music, and Amazon Music Unlimited are big, big, big, but at about $2.5 billion in annual sales, only half as big as legal weed. Viagra and Cialis can't stand up against legal marijuana, either. There's a huge potential market out there, with an estimated 52% of men experiencing erectile dysfunction at some point in their lives, but annual sales for the two drugs combined is still only $2.7 billion. From Tombstone to California Pizza Kitchen, take-home store-bought frozen pizzas are a traditional favorite of millions of Americans. And now, we're finally reaching sales parity with legal pot. Frozen pizzas account for $4.4 billion in sales each year, very near the amount spend on legally purchased marijuana. Retail ice cream sales come to $5.1 billion a year, just barely exceeding the high-end estimate for legal pot sales, but barely one-tenth the size of the estimated black and legal marijuana markets. That's still a lot of scoops, though. Let's go to the movies! Even though movie tickets aren't exactly cheap, people still pay for that theatrical cinematic experience to the tune of $11.1 billion in ticket sales per year (not counting snacks). That's only about a quarter of the size of the overall pot market. Being stoned on weed could make some of those lame loser movies more palatable. Pro football is a monster, dominating sports TV, radio, and internet for half the year and generating $13.3 billion in annual revenues. At the rate legal marijuana markets are expanding (just wait for California! ), legal pot sales alone could surpass NFL revenues within just a few years, and the total estimated market is more than three times what the league is bringing in. Pot is bigger than Vegas? Yep. And Reno and Atlantic City and all those casinos everywhere combined. Make no mistake -- gambling is big business, with Americans burning through $34.6 billion a year, according to the American Gambling Association, but Americans are burning through even more weed, and we'd wager that's going to go up, too. Daycare for kids isn't exactly inexpensive and it's an issue for millions of American working families. According to IBISWorld's market research, that's a $48 billion hit on the family budget. It's an awful lot of money. It's also more or less the amount Americans are spending on pot right now. Marijuana policy continues to motivate members of Congress, a leading drug testing firm reports that positive worker drug tests are on the rise, Maryland's first medical marijuana cultivator gets final approval to grow, and more. 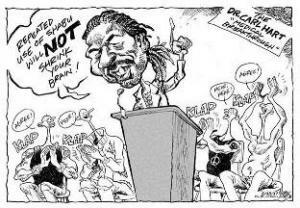 Racially charged cartoon from Philippines newspaper attacking Dr. Carl Hart, who criticized the Philippines drug war. Bipartisan Senate Bill to End Federal Marijuana Banking Ban Filed. Eight US senators running the gamut from Rand Paul (R-KY) on the right to Cory Booker (D-NJ) on the left filed a bill to block federal regulators from punishing financial institutions for doing business with state-legal marijuana-related businesses. The bill is not yet available on the congressional web site. Lawmakers Push Federal Legalization Bill. US Rep. Thomas Garrett (R-VA) and allies held a Capitol Hill press conference on Wednesday to try to gain some momentum for Garrett's Ending Federal Marijuana Prohibition Act (Senate Bill 1227), which was introduced in February but has gone nowhere so far. Garrett said that he had enthusiastically prosecuted marijuana offenders, but grew tired of "creating criminals out of people who otherwise follow the law." Joining Garrett was another of the bill's 11 cosponsors, Rep. Tulsi Gabbard (D-HI), who said "the question before us is not whether you think marijuana use is good or bad, or how you feel about this issue, but whether we should be turning people into criminals." Maryland Regulators Grant First Medical Marijuana Grow License. More than four years after the state approved medical marijuana, the state Medical Cannabis Commission voted unanimously Wednesday to grant final approval to the first firm licensed to grow medical marijuana, ForwardGro in Anne Arundel County. "A new industry in Maryland has been launched," said Patrick Jameson, executive director of the commission. "They can start to grow immediately." Fifteen companies were granted preliminary licenses last year, but none of the others have been granted final approval yet. Drug Testing Firm Reports Workers' Positive Tests at 12-Year High. Drug testing firm Quest Diagnostics reported Wednesday that 4.2% of drug tests among the US workforce came back positive, the highest rate since 2004, when it hit 4.5%. The firm reported increases in positive results for marijuana, cocaine, and methamphetamine, but heroin remained unchanged. "This year's findings are remarkable because they show increased rates of drug positivity for the most common illicit drugs across virtually all drug test specimen types and in all testing populations," said Barry Sample, senior director of science and technology for Quest Diagnostic Employer Solutions. DPA's Dr. Carl Hart Gets Death Threats, Insults for Speaking Out Against Duterte's Drug War.Neuroscientist and Drug Policy Alliance board member Dr. Carl Hart cut short a visit to the Philippines last week after his remarks challenging Philippines President Rodrigo Duterte's bloody war on drugs, his assertion that methamphetamine use "shrinks the brains," and his openness about his own drug use resulted in hostile ridicule from the president, a racist cartoon in a Manila-based newspaper, and death threats on social media. The Congressional Cannabis Caucus is getting down to business, yet another poll shows strong (and increasing) support for marijuana legalization, Trump names an acting drug czar, a California safe injection site bill is moving, and more. 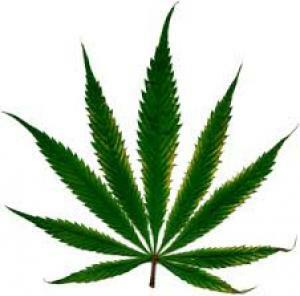 New General Social Survey Poll Shows Jump in Support for Legalization. Support for marijuana legalization surged last year, according to new data released by the General Social Survey. The poll has support for legalization at 57% in 2016, up five points from 2014. Package of Federal Marijuana Reform Bills, Including Legalization, Filed Today. The Congressional Cannabis Caucus flexed its muscles Thursday as members of Congress filed a package of bills aimed at creating a "path to marijuana reform" at the federal level and protecting and preserving marijuana laws in states where it is legal. Two Oregon politicians, Sen. Ron Wyden (D) and Rep. Earl Blumenauer (D) led the charge, announcing a bipartisan package of three bills, including a marijuana legalization bill reintroduced by Rep. Jared Polis (D-CO), as well as a pair of bills aimed at cleaning up "collateral issues" such as taxes, regulation, banking, asset forfeiture, descheduling, research, and protection for individuals. Click on the link to read our feature story and see more about the bills. Vermont Legalization Bill Hits Snag. The effort to legalize marijuana took a detour Tuesday when the House leadership indefinitely postponed a vote on House Bill 170 after it became apparent it didn't have enough votes to pass. The bill isn't dead, but it has now been sent to the House Human Services Committee, where it will sit until the leadership thinks it has come up with enough votes to pass. Arkansas Senate Approves Medical Marijuana Tax Bill. The Senate voted 31-1 Wednesday to approve House Bill 1580, which would impose a 4% tax on medical marijuana at each transaction. The tax would be levied on growers' sales to dispensaries and again on dispensaries' sales to individuals. The tax would sunset in 2019 after raising an estimated $3.6 million. The bill had already passed the House, but was sent back there for a concurrence vote after amendments were added in the Senate. Colorado Legislators Vote to Rein In Medical Marijuana Home Grows. The state Senate voted unanimously Wednesday to approve House Bill 17-1220, which would limit the number of medical marijuana plants grown at a single residence to 12. Under current law, up to 99 plants are allowed. The bill now heads to the governor's desk. West Virginia Senate Approves Medical Marijuana Bill. The state Senate voted Wednesday night to approve Senate Bill 386, which would allow for the use of medical marijuana for specified medical conditions. The bill now heads to the House of Delegates. Justice Department Report Scorches DEA Over Asset Forfeitures. 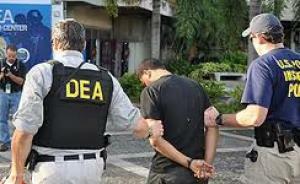 The Justice Department inspector general's office has released a report on DEA cash and asset seizure practices that warns the way DEA operates may pose a risk to civil liberties. The report noted that most seizures result from direct observation by DEA agents or local police, leading to concerns about the potential for racial profiling. The report examined a hundred asset forfeiture cases, and found that fewer than half advanced ongoing investigations. "When seizure and administrative forfeitures do not ultimately advance an investigation or prosecution, law enforcement creates the appearance, and risks the reality, that it is more interested in seizing and forfeiting cash than advancing an investigation or prosecution," the report said. Trump Nominates Richard Baum as Acting Drug Czar. The president has nominated Office of National Drug Control Policy (ONDCP -- the drug czar's office) veteran and Georgetown University adjunct professor Richard Baum to be acting drug czar. While some of Baum's remarks over the years have drawn controversy, he is generally viewed by insiders as having a public policy approach as opposed to a drug warrior approach. California Bill to Allow Supervised Injection Sites Advances. A bill that would create a five-year exemption from the state's drug laws to allow for the operation of supervised injection facilities advanced in the Assembly last week. The Assembly Health Committee voted 9-4 to approve Assembly Bill 186. The bill now goes to the Assembly Public Safety Committee. The Congressional Cannabis Caucus flexed its muscles Thursday as members of Congress filed a package of bills aimed at creating a "path to marijuana reform" at the federal level and protecting and preserving marijuana laws in states where it is legal. Two Oregon politicians, Sen. Ron Wyden (D) and Rep. Earl Blumenauer (D) led the charge, announcing a bipartisan package of three bills, including a marijuana legalization bill reintroduced by Rep. Jared Polis (D-CO), as well as a pair of bills aimed at cleaning up "collateral issues" such as taxes, regulation, banking, asset forfeiture, descheduling, research, and protection for individuals. "The federal government must respect the decision Oregonians made at the polls and allow law-abiding marijuana businesses to go to the bank just like any other legal business," Wyden said in a statement. "This three-step approach will spur job growth and boost our economy all while ensuring the industry is being held to a fair standard." The Marijuana Revenue and Regulation Act (Regulate Marijuana Like Alcohol Act) -- Remove marijuana from the Controlled Substances Act; impose an excise tax regime on marijuana products; allow for the permitting for marijuana businesses; and regulate marijuana in a manner similar to alcohol. The Small Business Tax Equity Act -- Create an exception to Internal Revenue Code section 280E that would allow businesses compliant with state laws to claim deductions and credits associated with the sale of marijuana. Currently, under 280E, people and businesses cannot claim deductions or credits for the sale of Schedule I or Schedule II substances. Sen. Rand Paul, R-Kentucky, is a cosponsor of Wyden's Senate bill and Rep. Carlos Curbelo, R-Florida, is sponsoring companion legislation in the House. Responsibly Addressing the Marijuana Policy Gap Act -- Remove federal penalties and civil asset forfeiture for individuals and businesses complying with state law; ensure access to banking, bankruptcy protection, research and advertising; expunge the criminal records for certain marijuana-related offenses; end requirement for residents of marijuana-legal states to take a marijuana drug test for positions in the federal civil service; and ease barriers for medical marijuana research. The three-bill package is just the latest pot law reform effort in Congress this year. At least five other bills have already been filed, and lawmakers are also planning to reintroduce the Rohrabacher-Blumenauer amendment, which blocked the Justice Department from funding enforcement efforts against state-legal medical marijuana programs, and the McClintock-Polis amendment, which would similarly block enforcement against state-legal adult use programs. That later amendment came up just eight votes short last year. The moves come against a backdrop of increasing acceptance of marijuana and marijuana legalization. Twenty-nine states now allow marijuana for qualified patients and eight states and the District of Columbia have legalized adult use. Public opinion polls now consistently show pot legalization with majority support; the latest came this week when the General Social Survey pegged support for legalization at 57% in 2016, up five points from just two years earlier. Groups supporting marijuana legalization pronounced themselves pleased. "The first time introduction of this particular piece of legislation in the US Senate is another sign that the growing public support for ending our failed war on cannabis consumers nationwide is continuing to translate into political support amongst federal officials," said NORML Executive Director Erik Altieri, "With marijuana legalization being supported by 60% of all Americans while Congress' approval rating is in the low teens, ending our country's disastrous prohibition against marijuana would not just be good policy, but good politics." "This is commonsense legislation that will eliminate the growing tension between federal and state marijuana laws," Robert Capecchi, director of federal policies for the Marijuana Policy Project, said in a statement. "Voters and legislatures are rolling back antiquated state marijuana prohibition policies, and it's time for Congress to step up at the federal level. States are adopting laws designed to improve public safety by replacing the illegal marijuana market with a tightly regulated system of production and sales. The federal government should be working to facilitate that transition, not hinder it." "If we are truly going to move our nation towards sensible marijuana policies, the removal of marijuana from the Controlled Substances Act is paramount. Annually, 600,000 Americans are arrested for nothing more than the possession of small amounts of marijuana and now is the time for Congress to once and for all end put an end to the national embarrassment that is cannabis prohibition," said Justin Strekal, NORML Political Director. "Passing this legislation would end the current conflict between state and federal laws and allow the states to implement more sensible and humane marijuana policies, free from the threat of federal incursion." Not everybody was happy. Former White House drug policy advisor Kevin Sabet, who now heads the anti-legalization Smart Approaches to Marijuana, told The Cannabist that more marijuana legalization would have negative consequences. "While we don't want to see folks locked up or given criminal records for smoking pot, we support federal laws against marijuana," Sabet wrote in an e-mail. "We need to end, not expand the special interest big marijuana lobby. We can't ignore the fact that today's legalized marijuana -- and the accompanying industry -- is damaging to public health. States that have legalized marijuana continue to see a black market for the drug, increased rates of youth drug use, continued high rates of alcohol sales and interstate trafficking." But Sabet's is an increasingly lonely voice in the wilderness. While the marijuana community -- consumers, industry, and advocates alike -- eyes with trepidation the reign of avowed drug warrior Jeff Sessions at the Justice Department, the Trump executive branch isn't the only game in town when it comes to making marijuana policy. Congress is back in session, and after last November's legalization and medical marijuana victories at the polls, the pot state delegation is larger than ever. And at least some of those senators and congressmen and women representing the 28 states (and the District of Columbia) that have embraced medical marijuana and the eight states plus DC that have so far gone for adult legalization, are gearing up to fight for reform at the Capitol. A nascent congressional Cannabis Caucus formed in December is preparing a plethora of bills for the current session, and its members say they are optimistic about their chances, even in the time of Trump -- and Republicans holding every committee chair in both houses. It's because Congress is riding the marijuana wave, too, said caucus founder and co-chair Rep. Earl Blumenauer (D-OR). 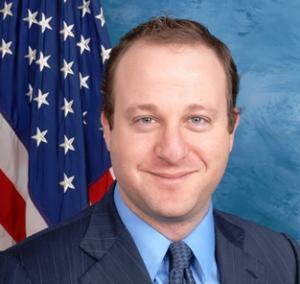 "This Congress is going to be a little better than last Congress, and last Congress was better than the one before that," he said in an interview this week with The Cannabist. "It's very interesting watching the momentum build." That momentum derives from public opinion polls consistently showing nationwide majorities favoring legalization and, more importantly, the actual victories at the polls in November, where legalization went four for five and medical marijuana went four for four. "It's easier for people to embrace much of what we're doing legislatively," he said. Fixing industry-critical concerns such as the lack of operating expense deductions or access to financial services for state-legal businesses or barriers to medical marijuana research are now mere "housekeeping" issues, he added. Nonetheless, fixes still have to get through the Congress. They haven't so far, and it's a long way between filing a bill and seeing it signed into law. 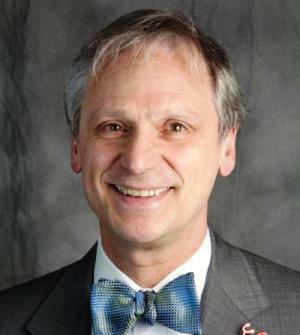 Still, Blumenauer and colleagues will be pushing harder than ever. He is joined in the Cannabis Caucus by co-chairs Reps. Jared Polis (D-CO), Dana Rohrabacher (R-CA), and Don Young (R-AL). The bipartisan grouping is notably made up of representatives from vanguard legalization states, but by no means all of them -- California alone has 53 House members -- and there is certainly room for more to come on board. "I'm more hopeful than ever before that we can move legislation like the Regulate Marijuana Like Alcohol Act," Polis told The Cannabist, referring to last session's H.R. 1013, which picked up 19 cosponsors and was referred to a slew of subcommittees, but never even got a hearing. H.R. 331 -- Filed by Rep. Barbara Lee (D-CA), the States' Medical Marijuana Rights Protection Act would block federal civil asset forfeiture aimed at the owners of state-legal medical marijuana operations. H.R. 714 -- Filed by Rep. H. Morgan Griffith (R-VA), the Legitimate Use of Medicinal Marihuana Act would move marijuana to the Controlled Substance Act's Schedule II, opening the door to more research and, potentially, doctors' ability to prescribe (as opposed to recommend) marijuana for patients. It would also bar the use of that act or the Food, Drug, and Cosmetic Act to interfere with medical marijuana in states where it is legal. H.R. 715 -- Also filed by Rep. Griffith, the Compassionate Access Act would reschedule marijuana, provide for its medical use under state laws, and remove CBD (cannabidiol) from the definition of marijuana. H.R. 975 -- Filed by Cannabis Caucus co-chair Rep. Rohrabacher, the Respect State Marijuana Laws Act would exempt people and entities from certain provisions of the Controlled Substances Act if they are acting in compliance with state laws. Rohrabacher authored similar legislation in the last Congress, garnering 20 cosponsors, including seven Republicans. There is no outright federal marijuana legalization bill out there yet this session, but expect to see Rep. Polis come back with his bill or perhaps Bernie Sanders reviving his bill to end federal marijuana prohibition, or both. Given political realities on the Hill, though, the Cannabis Caucus will likely save its political capital for fights it might be able to win, such as fixing the tax and banking problems facing the industry. Another key battleground -- and one where marijuana advocates have actually won before -- is the appropriations process. The Justice Department and the DEA can't go after marijuana in legal states if Congress bars them from spending any federal funds to do so, and that's exactly what Congress did when it approved the Rohrabacher-Farr Medical Marijuana Amendment last session. If a similar amendment were to succeed again, even if Attorney General Sessions wanted to call out the cavalry, he couldn't buy the horse feed, and it wouldn't matter how many nasty memos his deputies wrote. And while his past pronouncements are indeed worrisome, he was quite coy at his nomination hearings, saying that he "won't commit to never enforcing federal law," but adding that enforcement priorities are "a problem of resources for the federal government." Sessions did add later in the hearings that it's not "the attorney general's job to decide what laws to enforce," but suggested that his former colleagues could settle things once and for all. "I think one obvious concern is that the United States Congress has made the possession of marijuana in every state and distribution of it an illegal act," he said. "If that something is not desired any longer, Congress should pass the law to change the rule." And then there's Sessions' boss, President Trump. While he projects a law and order image and has campaigned against "drugs," the drugs he seems most concerned about are heroin and the prescription opioids -- not pot. He's also suggested in the past a willingness to let states experiment on marijuana policy, and he has a lot of other things on his plate. It's not at all clear he would let Sessions unleash a war on weed even if he wanted to. Earl Blumenauer doesn't think Trump wants to charge into this particular melee. "This is a struggle and will continue to be, but this is something where I honestly don't think the new administration, which has probably enough controversy on its hands, is going to knowingly pick a fight with what, almost without exception, was approved by local voters," Blumenauer said. To ensure that Sessions doesn't strike out, "we need to make the case directly to Trump" about the economic potential of the marijuana industry, said Polis. 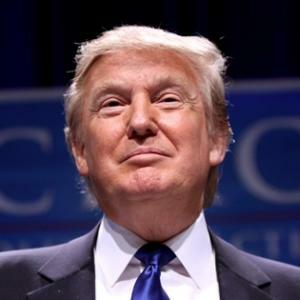 But until federal marijuana prohibition is ended, "the industry really exists at the discretion of the president and the attorney general, and that's a dangerous place to be," he added. Well, and Congress, too. It holds the purse strings, after all. Marijuana policy is going to be at play in the 115th Congress. Ending federal prohibition remains the Holy Grail, but in the meantime, there are concrete actions Congress can take to protect medical and legal marijuana and the industry it's creating. Now, let's see if the Cannabis Caucus can lead the way to some victories.